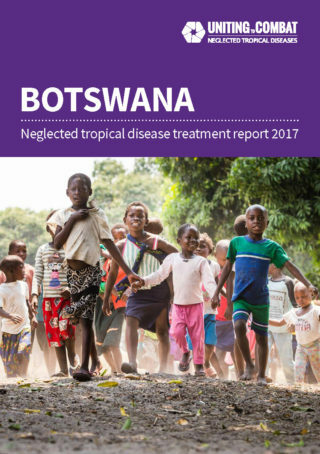 This country profile provides an overview of Botswana’s progress in reaching those in need of mass NTD treatment based on 2017 data. Botswana is commended for its leadership and commitment to address treatment gaps in NTDs, as demonstrated by the recent announcement by the Government to fully fund the national NTD programme with its own domestic resources from 2019. Botswana is encouraged to work with WHO AFRO for technical support in mapping bilharzia and to increase the coverage for both this disease and intestinal worms. Support the Expanded Special Project for Elimination of Neglected Tropical Diseases (ESPEN) established by WHO AFRO region for the elimination of these five diseases. Botswana does not require mass treatment for elephantiasis. Botswana does not require mass treatment for blinding trachoma. Treatment coverage remained the same at 29% in 2016 and 2017. Treatment coverage was not reported in 2016 and 2017. Botswana does not require mass treatment for river blindness. The ESPEN portal (a World Health Organization AFRO region project) provides maps and district-level data for the preventive chemotherapy diseases in Botswana.